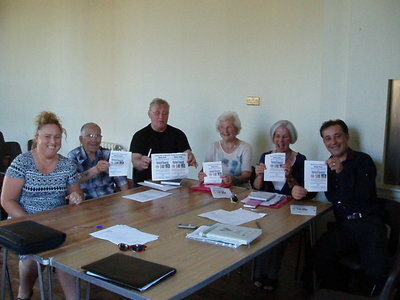 After running a successful campaign, the Riverside Tenants and Residents Group has been created. Local volunteers worked with staff from the Tenants Information Service (TIS) to organise a publicity campaign, generate awareness, identify local issues and communicate with local landlords and decision makers. A steering group has been formed, and has been in discussion with staff from East Lothian Housing Association and the Council to establish working in partnership to develop the Riverside Group. In general, the group plans to represent Artillery Park, Craig Avenue, Traprain Terrace, Abbot’s View, Riverside Drive and Riverside Place. The group can already claim success for recent improvement works to the Riverside Bridge. Rena Polson from the new group says: “We put our names forward for Riverside as we wanted to improve our area and make it a much nicer place for everybody to live. We would like as many people as possible to join us, we need your help”. Paul Laidlaw, Outreach Officer for TIS says: “A local tenants and residents group can do so much to improve the community by providing accurate advice and information and getting action on local issues. In fact they provide excellent value to the community giving people a voice on important issues that need attention. We will support the development of a group with hands on specialist independent advice and practical assistance”. If you live in East Lothian and are interested in getting involved with this new community group then get in touch with East Lothian Tenants and Residents Panel (ELTRP) on 0131 665 9304 or email tenantspanel@hotmail.com. ELTRP can also offer assistance with childcare costs and transport for anyone that wants to attend the meeting.